Located at the end of the runway, this aircraft observation park is designed to be a dynamic and engaging spatial experience — serving as both gateway and destination. As gateway, the park serves as the northeastern entrance to the airport used by travelers coming by public transit. 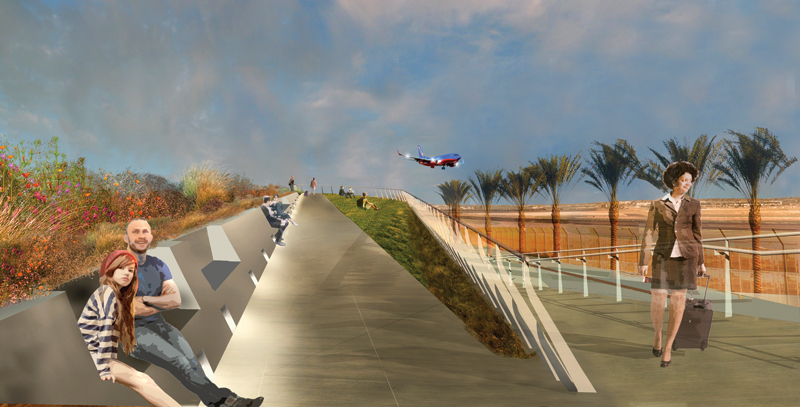 As destination, the park allows visitors a fresh and inviting perspective from which to watch planes land at the San Diego Airport. The project began by exploring how the park itself could elevate people off the ground. A gradual slope across the width of the site creates a gentle rise, allowing people a view over the security fencing to the airfield beyond. The rise culminates in a ridgeline running the length of the park. A lawn cantilevered over the roadway on the airport side extends past the ridgeline to create an area where people can lounge and picnic on the grass. Straight, sloped walkways pointing to the sky provide an accessible path through the park. The site was designed to meet SITES certification, and its plantings bring a piece of the native coastal Chaparral landscape vegetation to this urban site.